Ketchup rheology can appear in the funniest of places, and yesterday I found it at ~ 35,000 feet somewhere over Wisconsin flying to the Twin Cities from of all the improbable and most ironic of places, Chicago . I was pleasantly surprised to see a little one page writeup in the June 2014 issue of Spirit magazine  with the headline that the speed of Heinz ketchup is only 0.028 miles/hour. Somehow I don't really believe that Heinz measures the ketchup in dimensions of miles per hour, and in fact 5 inches/sec is the more likely equivalent measure. Except it isn't. A previous discussion in this blog about the ketchup rheology have highlighted the non-Newtonian complexity of this sauce, including that it is the yield stress of material and not its thixotropy that makes it so difficult to get it out of a glass bottle. And the article cites Prof. Graham of the University of Wisconsin who states the same. But beyond that, the material is shear-thinning, so the speed will depend greatly upon the test geometry and pressure conditions. Other than with very rare exceptions, non-Newtonian fluids do not have a constant viscosity . "If it comes out of the iconic glass bottle at any other rate, the company won't sell it." Except that will come out at all sorts of rates being a non-Newtonian fluid. And thank goodness for that. Tomatoes with a Newtonian consistency (pretty much impossible to imagine, since even simple tomato juice shows elasticity ) would just not cut it on a burger or meatloaf - two entirely appropriate locations for the sauce. 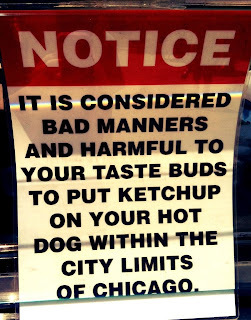 The irony being of course, that a Chicago-style hotdog is never served with ketchup. Signs like this abound on the Northside and elsewhere. 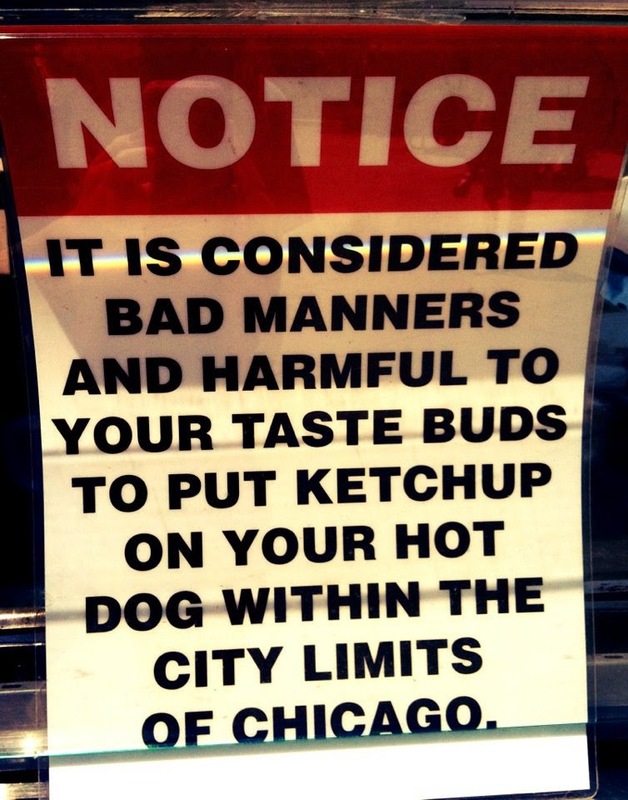 And here's the ultimate proof.If you know anything about Chicago, you know you don't argue with Mike Royko, the former venerable scribe of the Chicago Tribune. Spirit is the inflight magazine of Southwest Airlines, the official airline of the Spevacek household. Boger fluids would be the one example I can think of, having a constant viscosity but also showing elasticity. Pour some in a cup stirring it in one direction and then stop. Watch closely for the snap back.